Even with bugs, the show in ChefVille must go on, which is the case this week when it comes to Bello's Burger event that has been available over the past couple of weeks. While some of the quests in this multi-stage event have been allowed to expire and disappear from the game, there's another series of "Bello's Burgers" quests which are now available to complete in the game. Not to be confused with the original "Bello's Burger" quests, these introduce an upgrade to the Burger Station, and must be completed over the next eight days. Unfortunately, the in-game timer tells us we have 12 days, but we're actually on a stricter time schedule than that. Regardless, here's how to finish these Burger Station Upgrade quests in eight days ... not 12. The Burger Station upgrade requires four Shiny Vents, four Sizzle Stories, four Stack Statistics, and four Juicy Journals to complete. The Shiny Vents are earned by sending out individual requests to your neighbors, while the other three items come from general news posts on your wall. While you're waiting for those items to arrive, you can work on the Tomato Sauce, which are crafted in the Mixer using four Onions and five Tomatoes per batch. By now, you should have at least three Mixers in your restaurant though, so make sure to prepare all three batches at once if you're looking to save time. Finally, the Philly Cheese Steaks are prepared on the Grill using one Sirloin Beef, two Onions and one Salt each. You'll receive one Mayonnaise, 40 XP, and two Paprika for completing this quest. The Portobello Burgers are available in the Intermediate section of the Burger Station. A single Burger requires two Burger Buns, five Mushrooms, and four Romaine Lettuce to create, and it takes five minutes to cook. As for the Spicy Beef Burgers, these take two Burger Buns, two Paprika, and two Beef Patties to create, once every eight hours. Unless you're willing to spend Spices or Chef Cash to speed up this cooking time, you're looking at a pretty lengthy quest here, but thankfully, you've got eight days to complete all three quests for their prizes. 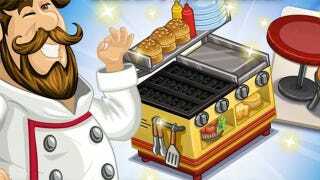 What do you think of this update to the Burger Station event in ChefVille? Were you ready to say goodbye to the burger event and move onto other things, or are you glad to find another use for your burger-themed ingredients? Sound off in the Games.com comments!